Remember the Strawberry Shortcake I made in my previous post? 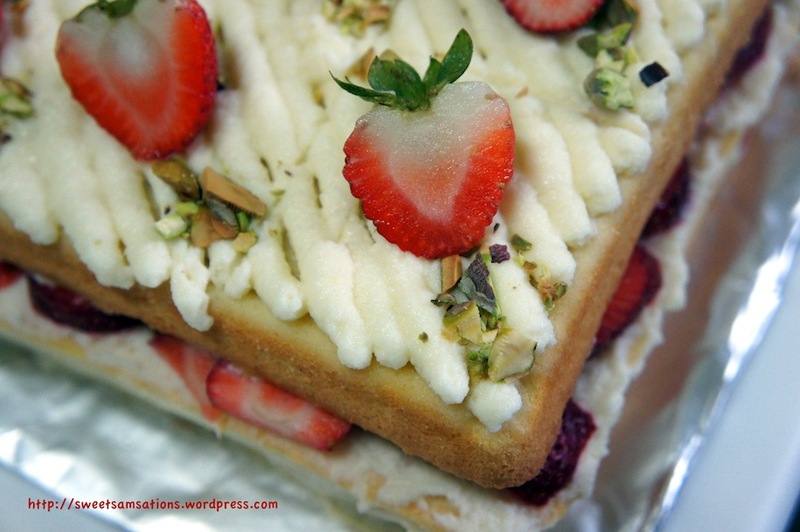 That is the old-school strawberry shortcake most of us are familiar with. The Japanese version however, uses a sponge cake base! They are also popular Christmas cakes because of the red in those strawberries! This will probably be my last Christmas themed post of the year. Gosh, it’s almost 2012 now! Anyway, I saw this cake at a couple different sites like Rima’s and Bertha’s. I believe the design might have originated from Singapore’s famous Bakerzin. You can find a picture of it here. I’ve always thought that sponge cakes were easy-peezy. After all, they’re the base of most cakes! But these cakes can really be quite tricky! Especially if you want it to be cotton soft and REAL spongey. There are so many different sponge cake recipes I’ve seen online and the methods employed may vary. They could be the separate egg method or beating the eggs until the ribbon stage. Most of them stress at the end though, that at the final stage, the flour must be folded into the batter in small amounts. I tried experimenting with Rima’s sponge cake recipe and unfortunately it didn’t work too well for me. My cake turned out dense, instead of cotton soft. It might have been because I over-folded the batter at the end or because I did not beat the eggs whites long enough! Will definitely follow instructions more closely in the future! The end result was still good and delicious though! My co-workers were very impressed with the pretty cake. My manager was so impressed that she initially didn’t believe that I made it. Anyway, I made this 3 layers instead of 2. Heat butter and milk until warm, but be careful not to let it boil. Add in sifted flour and corn flour and mix using wooden spatula. Pour your egg white mixture in three additions into your flour/butter mixture. Fold in gently. Pour batter into 3 separate 9-inch square pan and bake it au bain marie method for about 30 minutes. The original recipe called for 45 minutes, but my cake was already done by 30 minutes! As for the cream, I decided to use a mascarpone cheese one from Bertha. Combine all the ingredients and beat together until it forms a semi-stiff peak. I would definitely store any filling that I’m not working with in the fridge. The cream would melt otherwise. Assembling the cake isn’t too hard at all. 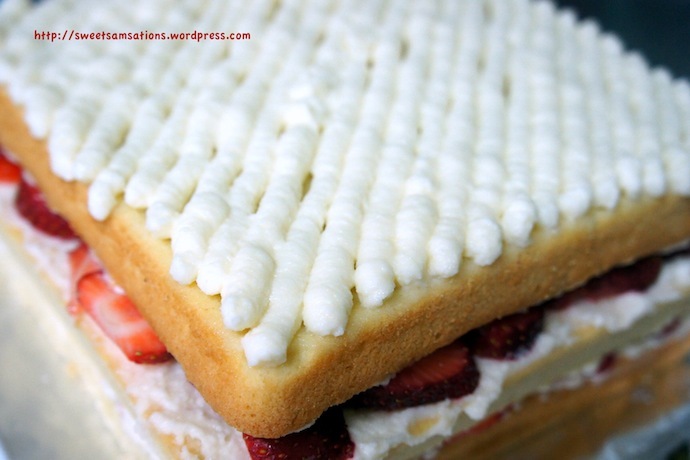 Simply spread the filling and sliced strawberries between each layer. For the top layer, I filled my ziploc bag with the filling and cut a hole to pipe the design on the top. 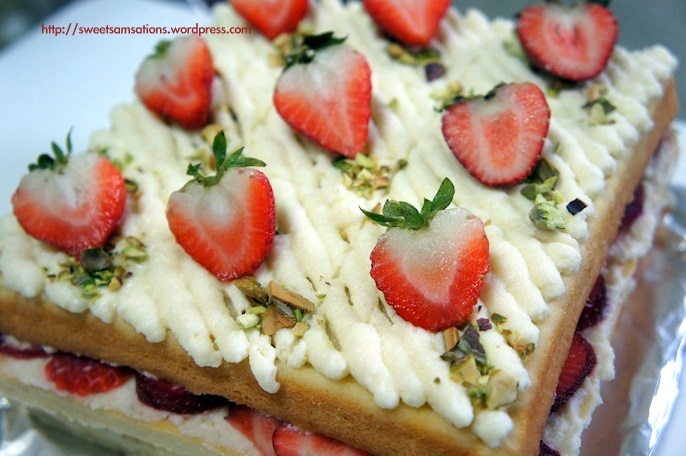 Later I top it with pistachio nuts and more strawberries. 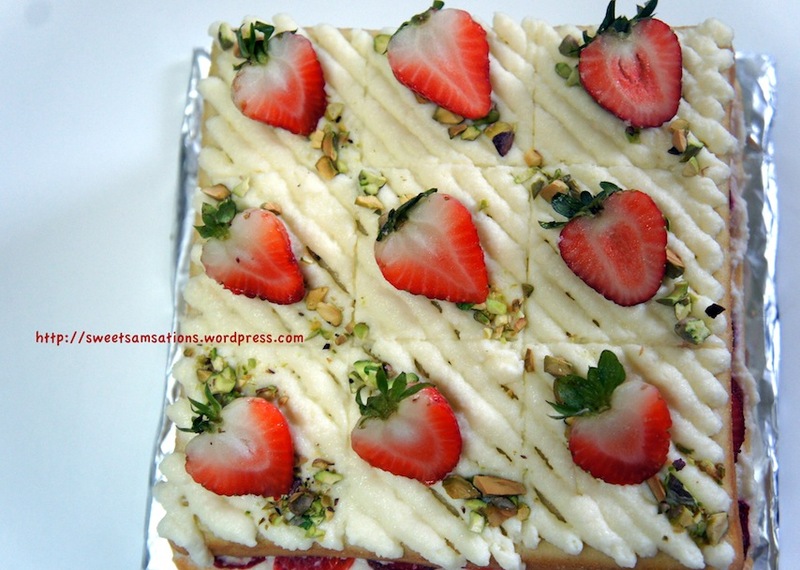 The green pistachio nuts with the red strawberries make this the perfect Christmas cake! Overall I was still pleased with the way this cake turned out! It tasted delicious even though it wasn’t too cottony! The filling was also to die for! Can’t wait to use mascarpone again! Cheers to the new year everyone! Happy 2012! Ooh what a beautiful, yet elegant perfect New Year’s eve dessert. Thank you dear! Happy New Year to you! 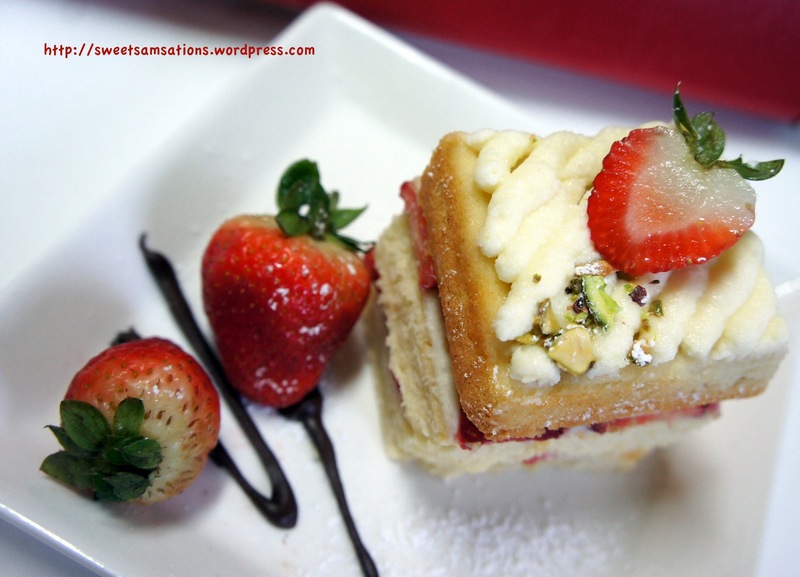 This shortcake is a winner! It sounds great and looks even better! Nicely done. Wishing you and your family a wonderful 2012. I hope all your wishes and dreams become a reality this year! ONE WORD: YUMMMMMMMMMMMMMMMMMMMMMMMMMMMMMMMMMMMM! 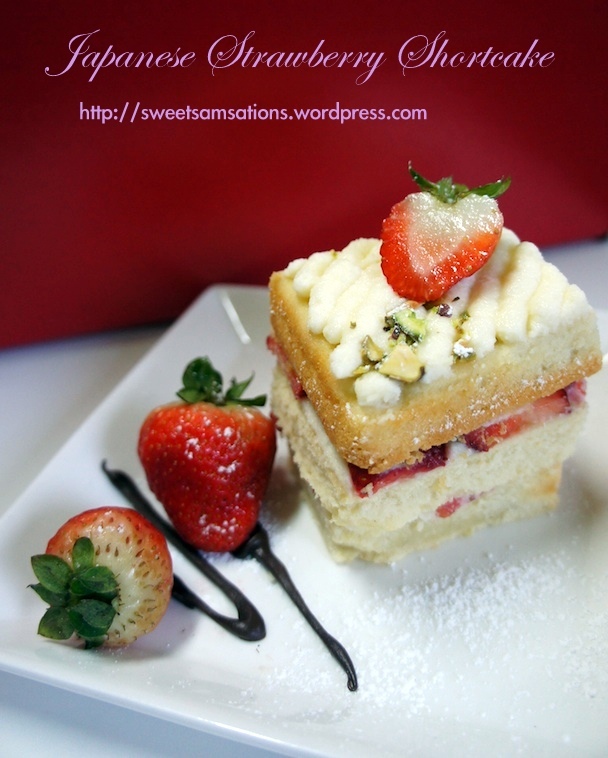 this looks better than the stuff they serve in most patissier here sammie! hahaha.. Thanks Natzieee! Don’t know about that though. They do have some crazy fancy stuff in Asia sometimes! sorry bb… they were all gobbled up already…. Very nice strawberry shortcake, feels like I wanna bite my screen off. This looks so fantastic! I am almost drooling. The photography is beautiful also! This is a great idea! 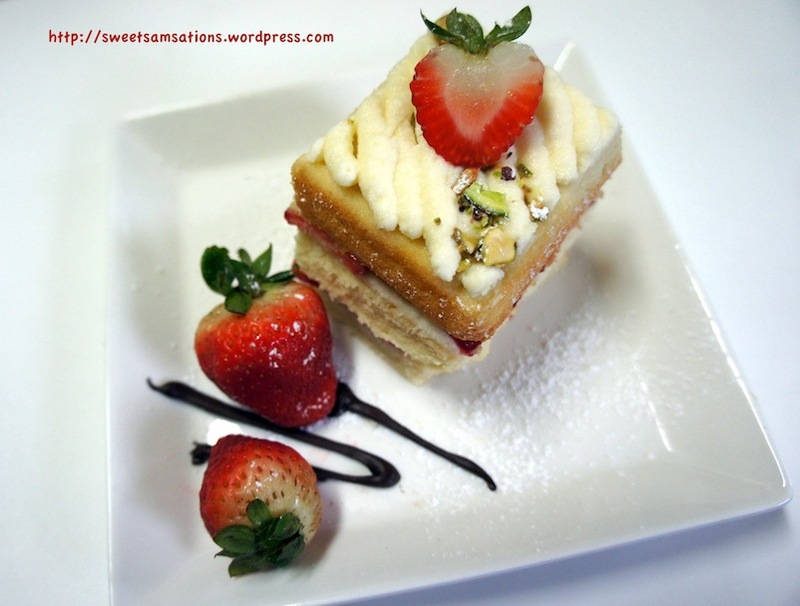 I always associate Strawberry Shortcakes with summer but this Japanese twist with sponge cake is an interesting notion. Thank you! 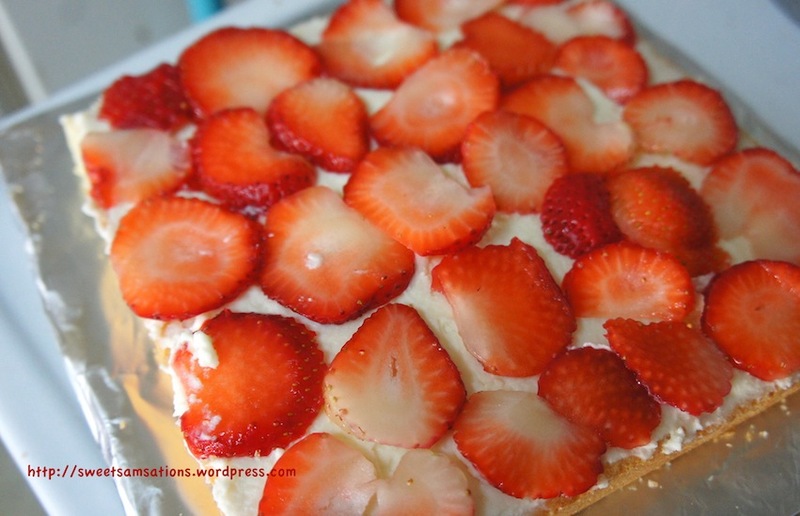 I think I love strawberries too much that I could eat strawberry shortcakes any day! These are so pretty! I love that they aren’t the traditional version I’m used to. I also love the use of mascarpone. Yum! Thank you! Yeah! They are quite different from the American strawberry shortcake! Mascarpone is ❤ !! That looks gorgeous! I guess you will have to keep on making sponge cakes until you get it the texture you want but I’m sure you will find many tasters to experiment on! There is a Hong Kong style bakery I go to that makes the most amazing, light sponge cakes. I will try to ask how they do it next time I’m there and see if I can get their secret. gorgeous.. I will be baking this item over the weekend too!